Tension settings are the ultimate in contemporary engagement ring design: their smooth, sleek lines and natural elegance highlights the perfection and beauty of the stone rather than adding distracting embellishments. These settings are not for everyone, however, and couples should understand the benefits and detriments of a tension design before choosing a ring. A tension design is a minimalist ring setting where the diamond or other gemstone appears to float in midair within the band of the ring itself. First designed in the late 1960s, this setting uses specially treated metals that have an inherent "springiness" to hold the ring in place. Rather than prongs, the entire band of the ring acts as two large prongs to hold the stone in place, usually with small carved niches that fit around the stone's girdle. With a tensile strength of 65-95 pounds, the stone is held securely in place with a unique floating appearance. Initially, many couples are concerned about the security of tension settings since the stone is only held in place through two points of contact rather than the more typical four or six with prong settings, or even full contact settings such as flush or bezel designs. 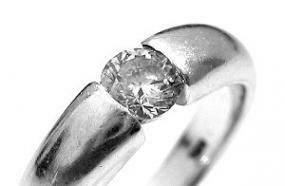 In reality, however, the stone is held more securely in a tension arrangement than in a classic prong style because the metal is generally stronger than that used for prongs, and more of the metal is in contact with the stone than through narrow prongs, therefore providing a tighter, stronger fit. Angled settings rather than perpendicular ones. Elevated tension prongs where the band is shaped like an omega rather than a circle. Accent stones that are channel or flush set into the band. 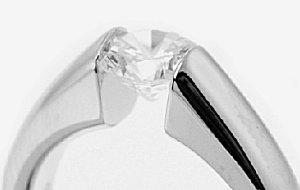 Twisted or "bypass" designs that hold the ring along the sides of the band rather than where the two cut edges would meet. Filigree patterns or other designs on the band itself. Combination settings where one side of the ring is held through tension and the other is held with a single prong. Initially, tension setting engagement rings were most suitable for men's engagement rings because of their simplicity, but with so many design options available today, more and more brides-to-be are opting for the understated elegance of a tension ring. The most commonly used metal for tension rings is titanium because of its natural strength and durability, but many jewelers also offer designs in platinum, white gold, yellow gold, and even stainless steel. Multi-tone rings are also available, typically with an inset of a contrasting metal or ceramic aligned with the stone. Emerald-cut diamond in tension ring. Only the hardest gemstones can withstand the pressure of a tension setting, making diamonds, rubies, and sapphires the top choices, though cubic zirconia and moissanite can also be tension set. Softer stones such as turquoise and pearls cannot usually be placed in a true tension design, though similar designs may involve other adhesive methods such as specialized glues, hidden prongs, or screws to help secure soft gems in a tension-style setting. The carat weight of stones in a tension ring are entirely variable, though couples should recognize that smaller stones may be overshadowed by the size of the setting (the entire width of the ring).To be sure the stone can endure the pressure of a tension ring, there must be no surface or deep internal cracks or flaws that could decay under such pressure. 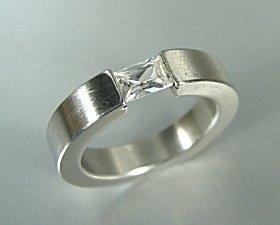 Because of this, treated stones are not typically used for these rings, since their flaws may not be easily apparent. Furthermore, only high-quality gems should be selected for tension designs because of the inherent openness of the setting: there are no prongs or other accents to conceal minute imperfections. At the same time, however, tension arrangements may help improve a stone's color because so much light enters and potentially brightens the gem. Despite the simplicity of basic tension rings, there are still problems with the design that couples must consider carefully. Because the metal band must be fashioned with a specific gem in mind in order to provide the proper holding strength, resizing is not usually possible. Also, engraving is not recommended because it can weaken the band's strength. Because of the nature of the ring design, tension rings cannot usually be paired with elaborate wedding bands, and wraps or enhancers are almost non-existent. Because tension settings must be customized for each individual buyer, they are usually only available at exclusive designers who regularly create one-of-a-kind rings. There are many online jewelry stores that feature tension rings, but prospective buyers should always investigate the merchant and their policies carefully before committing to a purchase. Minimalist and elegant, tension settings are an instant classic in contemporary ring design. With several options available for unique designs and customization, couples can choose to highlight their love with a beautiful stone that will be the highlight of a stunning and unusual ring.